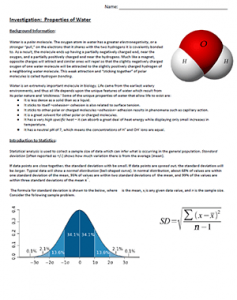 This investigation asks students to review the properties of water as they relate to life, usually a topic covered in the first or second chapter of most biology textbooks. Students then perform an experiment where they test the number of drops that can be placed on penny and compare that test to drops that contain soap. In addition, students must calculate standard deviation and standard error of the mean to display their data in graph form and show error bars. Basic statistical equations are provided in the lab and students should be able to follow the instructions with minimal guidance. Final analysis uses the CER framework (claim, evidence, reasoning). In most cases, students will find that soap results in fewer drops and there will be no overlap of error bars, students should make this claim in the reasoning section that they are confidence that soap affects the cohesion of water molecules. Students will need to use scientific reasoning to explain how soap affects hydrogen bonds using terms such as cohesion, surface tension and polarity. I am using many of your items for AP Biology and your system is working very well. Do Teachers have access to keys or answer sheets. I am very grateful for all the excellent material you have. In particular, the CER data is awesome. I have some keys which I put on TpT, but most are just in a big binder with my hand written notes. I use TpT to prevent student access to the keys, you’d be surprised how many requests I get from students who are pretending to be teachers who just want a shortcut for their work.